2016 was a bruising year for university endowments. More than 80 percent of the funds lost money, including the largest ones. Half of the ten largest university endowments ended up in the red, Trusted Insight’s research shows. 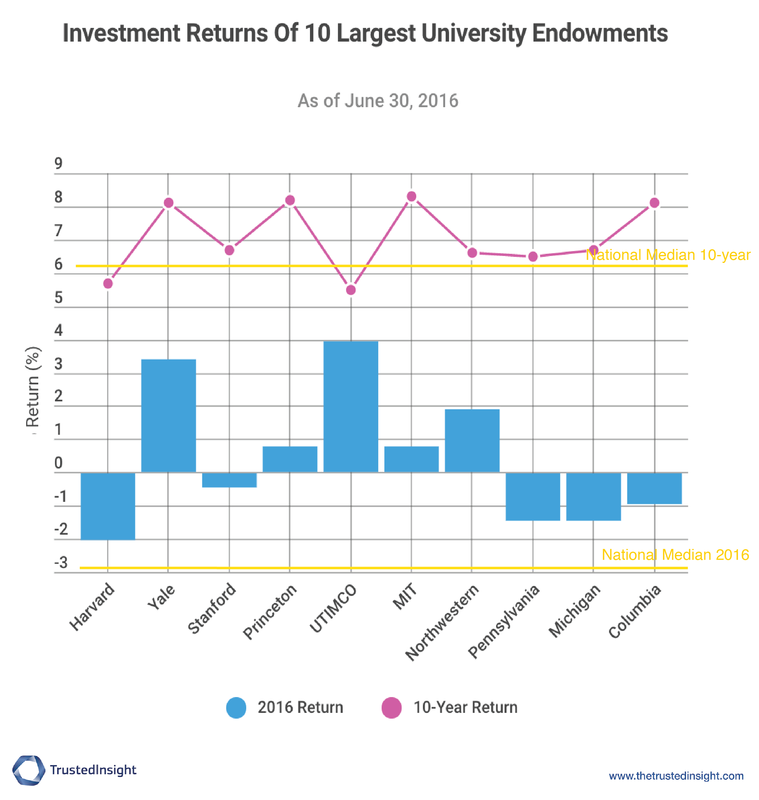 One may argue that endowments are long-term investors that should look beyond one year. So does a one-year loss translate into bad investing? For some universities, last year’s poor performance is representative of their ten-year returns. One university that we examined far outperformed all others in 2016, while it is in line with its peers on a ten-year scale. Another institution squeaked out positive results last year, but is outperforming every other institution on a long-term basis. Nationwide, the median 2016 return for endowments was -2.9 percent, according to Cambridge Associates. Of the 50 U.S. endowments researched by Trusted Insight, only seven reported positive returns, including five in the top ten: Yale, Princeton, University of Texas, MIT and Northwestern. Although everyone in the top-ten clique came out above the national median, most missed their target rates of return. Harvard, the country’s largest endowment with $35.7 billion under management, posted the worst results among the top ten with a 2 percent loss. This is 3 percent below its benchmark portfolio return. More specifically, Harvard’s loss was caused by its public equities and real assets investments. Both asset classes returned -10.2 percent in 2016, according to its annual report. The real estate portfolio returned 13.8 percent, but not enough to salvage the fund as a whole. Under impending pressure to revive performance, Harvard is taking aggressive steps to restructure its investment office. N.P. Narvekar, the new CEO who joined in December 2016, recently cut the existing staff by half and added a few fresh hires from prestigious investment firms. Much like Harvard, most endowments were whipsawed by public equities and real assets -- energy assets, in particular -- in 2016. Real estate and private equity performed well overall, but not enough to outweigh the damage. University of Pennsylvania, which lost 1.4 percent last year, said in its annual report that negative returns from these asset classes were only partly offset by strong positive returns from private equity, real estate and fixed income investments. On the other extreme, UTIMCO’s Permanent University Fund, the $17.9 billion fund that benefits both the University of Texas and Texas A&M University, returned a handsome 3.92 percent in the fiscal year ended August 31, 2016. Private investments, real estate and emerging markets equities were the biggest contributors to the return, according to its annual report. As long-term investors, however, endowments measure their financial health on more gauges than just one-year return. Ten-year annualized return is more relevant, as endowments are set up to support the operation of universities in perpetuity. Sadly for Harvard, its ten-year return of 5.7 percent also sat at the bottom among the top ten. It’s even lower than the national median of 6.3 percent, according to the 2015 (the latest available) NACUBO Commonfund Study. The study also shows that endowments larger than $1 billion outperform smaller ones by 1 percent over any ten-year period. Except for Harvard, this advantage is proved true by ten-year figures of the other top-ten schools. MIT, despite a mediocre gain of 0.8 percent in 2016, tops all other endowments of comparable size with a ten-year annualized return of 8.3 percent. Yale, Princeton and Columbia closely trailed with strong ten-year performance. MIT's Chief Investment Officer Seth Alexander has led MIT’s endowment since 2006. Alexander is a former apprentice of David Swensen, the famed chief investor at Yale. By the ten-year measure, he now has slightly outpaced his mentor. Alexander is also the highest paid individual at MIT, according to MIT’s school newspaper The Tech. Check out asset allocation of the top ten endowments here. Correction: A previous version of this article incorrectly reported the ten-year annualized returns of Stanford, MIT and UTIMCO, using 2015 or earlier data.